When my current little guy was a baby we were introduced to Sprout Organic Baby food pouches. Ever since they've been a staple in our home. I love that it is an easy, quick way to get veggies into my picky preschooler! The fact that they are NON-GMO and Organic is just the icing on the cake! Available in several stages including 'Starting Solids' up to Toddlers. They also have a line of snacks for parents! 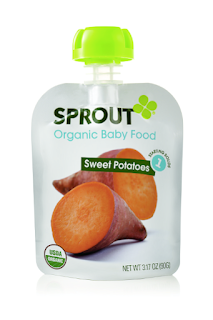 Look for Sprout Organic Baby Food pouches in your baby grocery isle or purchase online. You can use their online store finder to find a location near you!